I've been needing a new case for my iPhone for a while now and like a lot of you, I'm sure, I said to myself... I should MAKE one! OK, are you dying in anticipation of wanting to know how to make one yourself? Well, here ya go! Cut a vertical slit in the back of the tube at a perfect 90 degree angle from the base of the tube. I recommend investing in a pair of laser scissors because you want to get this perfectly straight. After all, this iPhone case is made out of a toilet paper roll and you don't want it to look shoddy when it's done. Here's a picture of me pressing one of the buttons. And here's a picture to show you how sturdy the iPhone case is. I had my husband take a picture while I pressed all the buttons at a rate of 3 buttons per nanosecond. I hope you've enjoyed this and that you all post pictures of your own iPhone cases using this tutorial! I have a two big pieces of news that I want to share with you. 1. NameMedia (the company that acquired Craftster in April 2008) decided to sell their "home and garden"-related communities to a company called Internet Brands. 2. I'm moving on from the world of Craftster. I know this is big news (for me anyway! and maybe for you!) so here's some more information that you might be curious about. Why did NameMedia sell Craftster? NameMedia decided to shrink back the online community part of their business in order to focus on the parts that made more business sense for them. Internet Brands does a few different things but their biggest focus is running "niche" online communities. If you go to their website you'll see they they have acquired a couple hundred online communities on just about every subject under the sun. They also happen to own the online forum software package called vBulletin. What can Craftster expect from Internet Brands? Internet Brands has lots of experience with what to do and what not to do with community sites. You can see from the sheer variety of sites they own that they also appreciate that each community has it's own unique personality and they don't try to force all communities to fit a single mold. They have lots of people working for them -- content specialists, programmers, server admins, ad sales people, marketing people, etc etc. So I can't promise that I know exactly what they are going to do but since they have invested in buying Craftster, I think we can expect any potential changes to be made carefully and judiciously without rocking the boat and with the only intention being to improve things. I also think that since we've been through the scary process of being acquired once and realizing that the buyer's intention is not to do something crazy and harmful to the site, that we can rest assured that this is the case here too. In all honestly as a result of my conversations with Internet Brands I feel totally comfortable with their views on running online communities. sweets4ever, jungrrl, rackycoo and kittykill are all going to continue be on Craftster's staff to continue their awesome work on Craftster with Internet Brands. And of course the fabulous Craftster moderators are still in place. Internet Brands graciously offered me a position which would allow me to continue to be involved Craftster as well as to take on some other interesting tasks at the company. I really appreciate that they saw the potential in me for this job and it was really tempting in many ways. 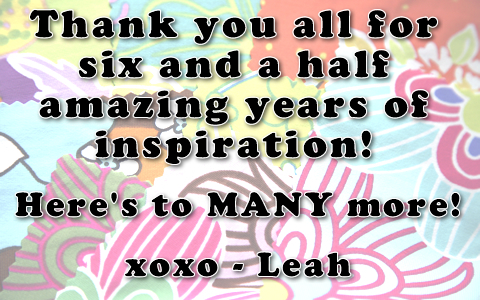 But I decided that after 6.5 years running Craftster, it's a good time for me to try doing something different in life. So, I'll soon be on my way! It's definitely going to be huuuuuuuuge change for me but I think it will be good. I've loved running Craftster and feel soooo lucky to have been able to do this for the past 6.5 years, but I'm also looking forward to trying something different. Thank you to everyone -- members, guests, mods, and the Craftster staff -- for everything YOU have done to make Craftster the amazing community it is today. I always say that I'm the one who keeps the plumbing working but that YOU ALL are the ones that keep the heart beating and keep the Craftster spirit alive! I'm so appreciative to each and every one of you for making Craftster the BEST crafting community on the Internet and giving me so much to be proud of and humbled by every day! P.S. Last night at 9:00 pm I decided Craftster has long deserved a highlights video reel! I wish I'd started working on it sooner because there's lots more I would have included but here's where working from 9:00 p.m. to 4:00 a.m. got me! And best of all, think of ALL the highlights yet to come. craftster highlights 6.5 years in 2 minutes from Craftster Video on Vimeo. It's the CHA Craft SuperShow! January 22-23 in Anaheim, CA. 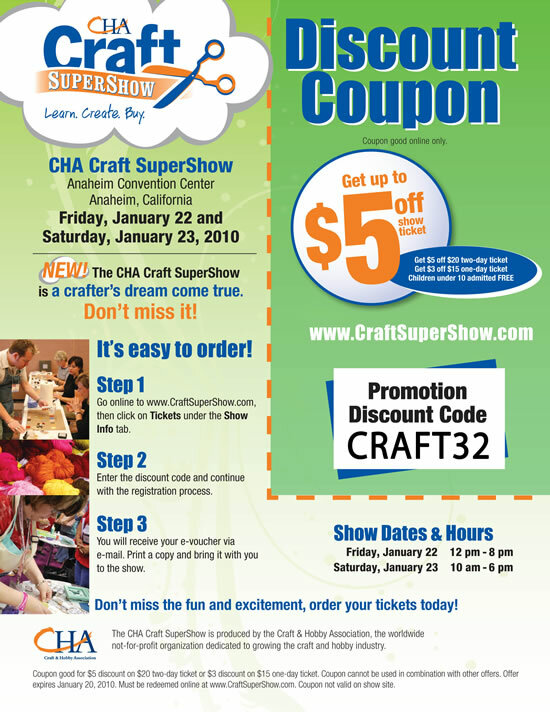 What is the Craft SuperShow? It’s a ginormous show which is put on by the Craft & Hobby Association (CHA). At the show you’ll find workshops, product demos, free “make and takes”, amazing craft products you can buy, craft celebrity appearances and so much more! Have you ever been to a car show, boat show, home show, etc? Have you ever wished there was something like that just for crafts? Well this is even better than that! PROJECT RUNWAY: Season Six - Season Finale! Remember, no spoilers (that means don't talk about who won or lost the episode) until the West Coast episode is done airing.